FLAAR uses background paper from Savage Universal Corporation for digital studio photography. Background paper for digital studio photography. 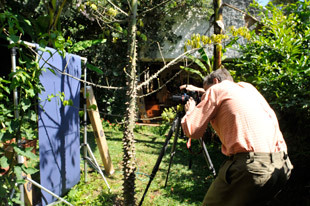 These views are in our studio in Guatemala, where we are doing a Mayan ethno-botany project. 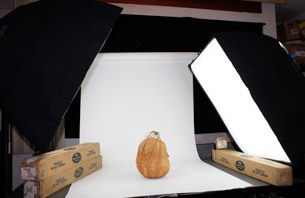 This means we are photographing all the fruits, vegetables, and other plants that serve as a utilitarian use for the Maya people of Guatemala, as well as plants that were eaten. This is pitaya, the fruit of a cactus-like night blooming vine that grows wild all over the country. If I remember correctly, they also have backdrop colors that can be used for green chroma key and blue chroma key. Just be sure to light your subject carefully so the reflection from the green or blue does not color the back of your subject. Savage makes several dozen different colors. We hope to experiment with various colors, especially to photograph the multi-colored fruit that is available in tropical Central America. FLAAR does evaluation of photography equipment primarily in Guatemala. 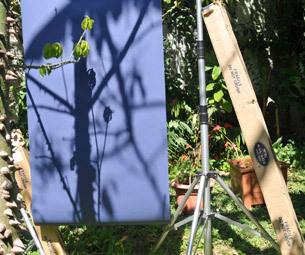 Yes, there are cheap ways to jerry rig your own homemade backdrop stand. But they sag, and look unprofessional. It is more professional to have a background stand. If your studio is for serious commercial photography, then you would need a background stand for holding at least three rolls at a time. 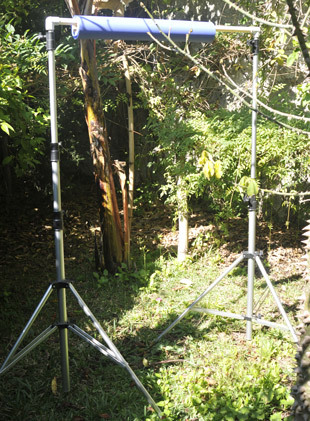 Savage Universal Corporation makes four styles of background stands, including a portable one. Until I visited their website four years ago I did not realize that Savage, which I know for decades for their backdrop paper, also has added fluorescent lighting. We can't comment on them otherwise until we have them available in our studio, but it is clear that fluorescent lighting is becoming increasingly popular for digital photography. can be handled by photo assistants without a year's prior training! Studio equipment which results in attractive results. Thirty years ago I used seamless background paper from one brand. Year after year, decade after decade: one major brand of seamless paper. Then about 12 years ago I met the hospitable team at SAVAGE Universal Corporation. I switched to using their material. Now we at FLAAR ethnozoology, ethnobotany, and archaeology photography institute use exclusively backdrop products from SAVAGE. And were photographing with their Savage backdrop material a few meters from the Pacific Ocean a week before Christmas. Since we actually use this brand (Savage Universal) WIDETONE, we recommend it to photographers in studio situations, as well as for out on location. Since snails and most seashells are wet, even when you try to dry them off, they still leak liquid from inside. So your background material for field work needs to be vinyl. Savage offers their Infiniti Vynyl in white, black, Chroma green, and gray. We look forward to having vinyl background material from Savage since we do a lot of photography of flowers and insects and reptiles out in the remote rain forests of Guatemala, Central America. Most creatures urinate when you place them on a photo stand. We are nice to them, we return them to their natural habitat, but to get a scientific record of their species it is essential to have a creature on appropriate background material in a photo studio (we take the studio out to the swamps and jungles). Most recently updated Feb 5, 2013. First posted June 19, 2006, updated September 9, 2010 and Jan. 11, 2013.